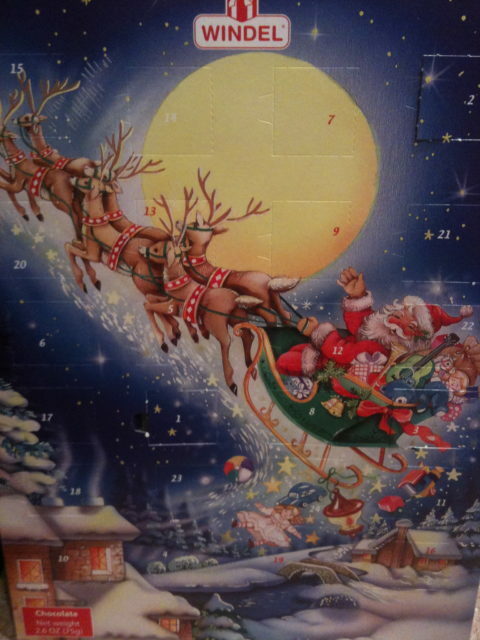 Christmas is much anticipated in our home and what better way to count down than with an Advent calendar. I purchased this German Advent Calendar at a locally owned store which sells kitchen items, toys, and lots of specialty foods. I figured I would let Q open the door and have the piece of chocolate with dinner each night. 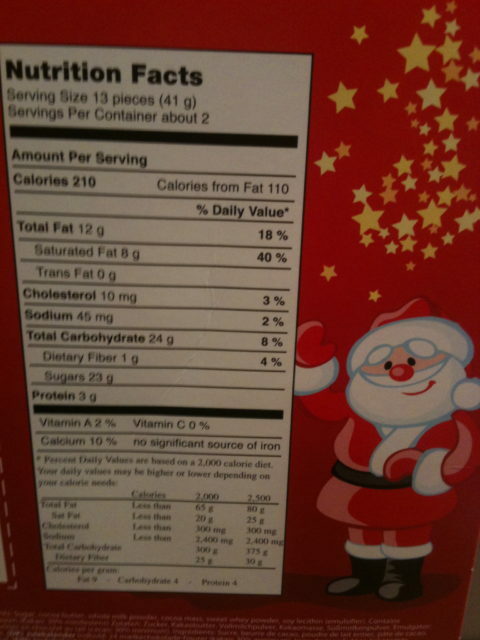 But when I looked at the nutritional data, I realized that each piece of chocolate has less than 2 grams of carbs each. She’s been enjoying these chocolates without insulin when she gets home from school each day. And here’s my tip: These cost about $2.50 each. If you have two kids, purchase two. Yes, it’s better to give than to receive, but trust me, the kids will appreciate having the opportunity to open their own door each day. This is so funny – because of Adam’s diabetes, I went out and bought the kids these Playmobil advent calendars with toys in them. They looked at them and were like, “eeehhhh….we want the chocolate!” Once I realized how few carbs were in each piece I relented and they have totally forgotten about the Playmobil calendar…they make a beeline for the chocolate every day! I was going to buy the Playmobil one, but the toy store didn’t have it this year! They had a variety of ones by eeBoo that you open up and all there is is a picture. Cute, but not really a treat, right? Can you save the Playmobil for next year? Little chocolates are the easiest way to give these guys a treat after dinner…or with advent calendars… I love that it is a quick, easy, and non-blood sugar busting option for our children. Great information Leighann. A lot of kids at school get candy in their lunches. I don’t routinely do this (wouldn’t with OR without diabetes), but I do occasionally pop in a small chocolate treat that’s only a few carbs like a Hershey’s kiss or other small candy. And I LOVE chocolate. I can’t deny her if I indulge myself. We do small dark chocolates A LOT around here for after dinner treats. They are great because of their low carb content! We are doing a Playmobil advent calendar this year which is AWESOME! It is a forest scene and each day a door is opened up and a part of the scene is the treat – animals, trees, food for the animals and eventually santa. Addison has been enjoying it immensely and there are no carbs to worry about either! Jen- I actually was in search of the Playmobil Advent calendar, but our local specialty toy store didn’t carry them this year. So I went for the chocolate one. I was so pleasantly surprised to see how few carbs were in each piece. I think it’s all about the celebrating and excitement and the counting down. The kids just like a treat whether it’s chocolate or a little toy. Funny, because I just got a couple of these at Trader Joes this morning! I was feeling sad when I saw all the other Moms with them and thinking of last year when carbs did not matter to us. 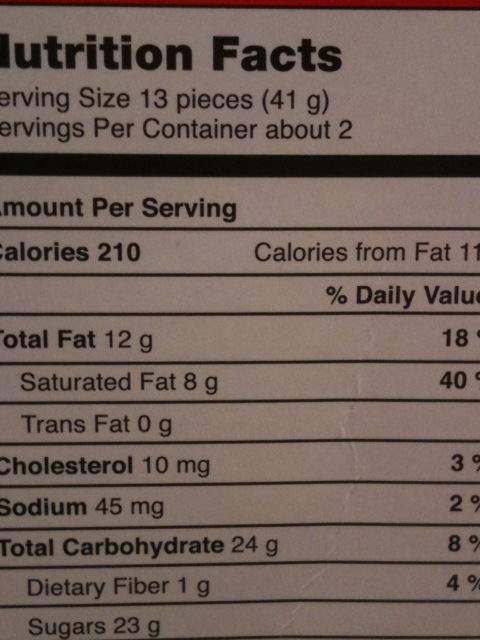 Then I checked out the carb count and was happy to see they are only a little over a carb each! Perfect! They even gave them away free to those with kids. Nicole- In the beginning I kept thinking of all the things Q would be deprived of. But it’s so nice when we don’t have to deprive or limit them! Free at Trader Joes? FTW!